Normally vegetables are grown from seeds. But there are some vegetables that can be regrown from kitchen scraps. Are you new to gardening? Do you often fail to grow vegetables and herbs from seeds? Then continue reading below to find details on how to regrow plants from scraps, grow from cuttings, and a list of such foods that can be regrown again and again. For example, you can regrow coriander from roots after cutting from coriander you buy from supermarket. There are many advantages of regrowing foods from scraps. Basil, beets, Bok Choy, Cilantro (Coriander), Carrot Greens, Celery, Lemon Balm, Ginger, Green Onion, Leeks, Onions, Lemon Balm, Lettuce, Mint, Radish, Rosemary, Spinach, Turnip, etc. The advantage of regrowing vegetables from the scraps (unused portions) is that you don't have to germinate the seeds. Many times when you try to grow vegetables and herbs from seeds, it may happen that the seeds do not germinate due to incorrect soil or weather or some other reason. This regrowing method of propagation is ideally suited for a person new to gardening. You get your own organic vegetables and herb garden. The cost of regrowing is very very low. This is an interesting experiment, not only for kids but also for grownups. It is a fun to watch the scraps regrowing. When I told my daughter in USA about this method, she got very excited and started trying the method. The kids will be very much interested in this experiment. 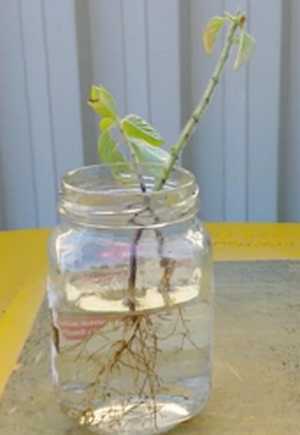 This regrowing method can be done by school students for their have hobby garden activities. Following are the two methods of regrowing herbs and vegtables again and again. Some of the vegetables will regrow from their roots. Just put the roots which you normally throw away in soil and keep in partial sun light. You can regrow coriander, spinach, radish, beets, etc from scraps like roots which you throw away after cutting. Following are the steps for regrowing plants from roots. The vegetables like coriander, green onions, radish, beetroot, spinach, etc. can be regrown from their roots which are normally thrown away. Cut the root below the green portion leaving 1 inch of top green portion. Plant the root portion, cut side down in soil or saucer containing water. Place in partial shade and keep moist. The root top will start to grow new shoots in a few days. For regrowing green onions or normal onions and garlic, just cut the tiny root portion and bury in soil or place in a water saucer. Some of the herbs and vegetables will regrow from their thin stems. They can be rooted both in water and soil. Following are the steps for regrowing plants from stems. Take a 4-5 inch long stem and cut just below a node. Remove leaves from the lower 3/4 of the stem. Place the stems in a glass of water and keep in partial sun light. Change the water every third day. When the roots are about a inch long, you can transfer them in soil. Keep the pot in sun. Examples of vegetables and herbs that can easily be regrown from stems are Basil, Bok Choy, Coriander/Cilantro, Carrot greens, Lemon Balm, Mint, Onions, Radish, Rosemary, Spinach, Turnip, etc.